Today, I’m going to teach you one of the most important skills you can possess when it comes to playing ukulele (or any type of music for that matter): how to transpose a song. 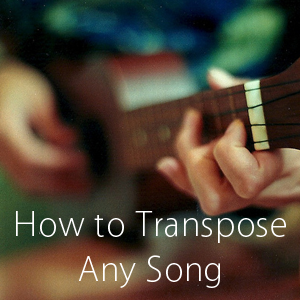 There are many reasons why you would want to transpose a song. Have you ever tried playing a song on the ukulele but found it to be impossible to sing along with because the key was either too high or too low? To fix this problem, you might transpose or change the key of the song or chord chart to make it easier to sing. A lot of songs are written in weird keys like Eb, F#, or Db. The chords found in these keys aren’t the easiest to play on ukulele, so you might transpose the song to a different key with easier chords. Transposing allows you to be really creative. You might transpose a song to get a specific tone from a different set of chords. You also need to transpose a song if you’re trying to arrange two different songs to flow together in the form of a medley (e.g. Somewhere Over the Rainbow –> I’m Yours). You never know when you might need to change the key of a song, so let’s take a look at an easy formula for how we can do this. First of all, transposing a song is not hard. However, we do have to familiarize ourselves with some basic music theory in order to do it well. For this lesson, you’ll want to make sure you are familiar with how major scales are formed. For those of you who are lazy (it’s okay), I have included a cheat sheet at the bottom of this lesson. I encourage you though to continue reading, because if we know these basic concepts, we can transpose any song in our head in just seconds. When I transpose a song, I use a really common technique called roman numeral analysis. This means that every chord in a song has a specific roman numeral that can be assigned to it. Awhile back, I wrote a post called Ukulele Scales Explained for Beginners. In that post, we learned that the major scale is the most popular scale used in music today. As we looked at how a major scale is formed, we learned that there are seven notes in the scale. For the purposes of this lesson, you need to know that we can take each of the seven notes in a major scale and build a chord off of each note using the other notes in the scale. An important note to add is that just because we are dealing with major keys doesn’t mean that all the chords within that key are major. A major key will have a combination of major, minor, and diminished chords. In the chart above, major chords are represented in uppercase. Minor chords are represented in lowercase. The lowercase chord with a superscript circle is a diminished chord. So for example, let’s take the notes of a C major scale, in ascending order (C, D, E, F, G, A, B), and “plug” them into the above roman numerals. This will give us the chords used in the key of C major. We can do this with any key assuming we know the notes found in a particular major scale. When we think about chords in terms of roman numerals, we are able to easily change or transpose the key of a song. For example, let’s say we have a song in the key of C major, but we want to play it in the key of G major. Let’s use Somewhere Over the Rainbow as an example. The first four chords of the verse in Somewhere Over the Rainbow are C, Em, F, and C. However, we want to transpose these chords to the key of G.
First, let’s represent those four chords in the key of C major as roman numerals. I’m simply referring to the chart directly above. This means that the first four chords in the verse of Somewhere Over the Rainbow are a I, iii, IV, and I chord. Since we want to transpose to G major, we need to know how the chords in G major are represented as roman numerals. If we build a major scale, we know that the seven notes in a G major scale are G, A, B, C, D, E, and F#. Let’s plug those notes into our roman numerals like we did for our C major scale. As we can see, the I, iii, and IV chords in the key of G major are G, Bm, and C.
We have successfully transposed the first four chords of Somewhere Over the Rainbow from C major to G major! I’ll let you transpose the rest of the chords for the song from here. Learning to see chords as roman numerals is the best way to be able to transpose a song. If you’re just beginning to get a feel for all this, it can be a bit overwhelming to try to figure out the notes and chords for every major scale (there are a total of twelve!). This is why I’ve created this cheat sheet for you to reference whenever you need to change the key of a song. Enjoy! How’s the transposing going for you? Do you have any questions? What tips do you have for transposing songs? Post your comments below. This is an awesome trick!! I’ve always wanted to learn, but can’t really understand it. Thanks for posting!! I recently picked up a concert uke in Hawaii and just ran across you website. This is all great stuff. Thanks for the recent post. I always wondered how it was done but didn’t realize how easy it would be for me to do it. I look forward to more tips and songs. This is wonderful! I can now train my vocals after transposing. A very neat trick. That’s what you get I suppose when you’re in contact with a real pro! Any tips for ‘tingling’ finger tips? Just started the ukulele and this has really become a bugbear. Hey Michael! I can say that any tingling or soreness on the ends of your fingers is really normal when you first start playing ukulele. I wish there was a magic solution, but the best thing to do is to consistently practice for short periods of time and then rest your fingers. Basically, you don’t want to push yourself so hard that your fingers start to bleed. 🙂 As you practice consistently and in fair amounts, your fingers will start to build callouses which will make playing chords really easy. This is one of the best ukulele websites I’ve visited. Brett, you are a very good teacher and I appreciate that you are sharing your knowledge with us. Thank you! Brett, thank you so much! I love your website! There an easier way to transpose. Just go to the site called “the Ukulizer”. lzerone, I checked out “the Ukulizer.” Looks like a cool site. However, I didn’t see any information on how to transpose a chord chart or any tools to help you do that. I do see that the chord charts they have posted are transposable, which is cool. Thank you Brett for helping me to play the ukulele. but looking at you playing and explaning helps me a lot. Thank you again Brett and keep on strumming. Good chart. I think I would invert the order shown so if someone wants to raise the key and pitch to match a voice they would do it opposite as shown. I appreciate the support, Tony! 🙂 Thank you! You have set me at ease. Theory IS SCARY!!! but i do have more questions. how can i transpose if i’m not dealing with a song with a major key? gladly appreciate any advice on this! That is a great question! Essentially, the same theory and technique applies in the sense that you need to figure out how many steps you are transposing or down too. For example, if you are in the key of E harmonic minor and you are trying to transpose up to the key of G harmonic minor, you would be transposing your chord up three half steps. So, your i chord (E minor) would become G minor. For another example, going from E harmonic minor to G harmonic minor, your V chord in E harmonic minor would be B major. If you were to transpose this up three half steps to the key of G harmonic minor, this V chord would become D major. It all comes down to knowing how many steps you are transposing up or down to. Hey, Brett! Thanks for these awesome tips!!! I play acoustic guitar, not ukulele, so I’m not exactly sure how I got here, haha… but I’m glad I found it, this page is now in my bookmarks bar, for frequent reference. Just wanted to say thanks for making (what I thought, anyway) a difficult subject clear and understandable. Let me first say that you have made a wonderful and massive group of great information here. I’ve played guitar for awhile but just got into the uke. I’ve been going through all your videos and such and this part was extremely helpful. My wife and I like to sing together but sometimes it’s too low for her to sing , which is why this is awesome. My only question deals with notes like E7 and others with add (insert number here). Like in somewhere over the rainbow example you provided, in the key of G, how would that work? Thanks again and looking forward to browsing more. With chords like E7, the principle still applies. For example, with “Somewhere Over the Rainbow”, it’s in the key of C. An E7 chord would be a chord built off of the 3rd step of a C scale (E). If you were trying to transpose “Somewhere Over the Rainbow” from C to G, we know that the chord built off of the 3rd step in a G scale is B. So our E7 chords would become B7 chords. Another way of looking at it is, from C to G you are transposing up 7 half steps (an interval of a 5th). This means that all chords need to be raised up 7 half steps. An E7 raised 7 half steps is B7. Perfectly, thank you. I’m still getting the hang of music theory and it’s inner workings. Playing guitar for awhile I just got the memorization of the chords but never really learned how they were made. Sometimes it’s hard to progress that way so I’m taking the next step, and a lot of that has to do with your lessons here so thank you again. You left out Gb Major on the cheat sheet. Could you add it for me? Updated with Gb major! Just note about Gb major… some songs will use F# major instead. F# = Gb in terms of pitch. It’s an enharmonic tone. The sharp and flat notes are all enharmonic. That’s as much as I will say on it for now, as it’ll probably make a good post in the future! Thanks for detailed clarification how scale build on formula, I am finding very difficult to play any chords, due to fingers pain and while playing chords sound clarity also very poor, how to improve? For those of us who don’t know what key it is in when we look at the music, it would be helpful to have the number of flats or sharps for each key. Many, many thanks. You’re fan-frickin-tastic. I really appreciate it! Brett. I understand the concept of transposition.. My question is, Does anyone make a uke that has different tuning frets that enable a uke tuned to a 4 step down key similar to the way harmonicas come in different keys? (Multlple ukes for different keys) This would make the chords easier to find if a person was having difficulties making certain difficult fingerings work for them. Thanks for answering this off the wall question.. Excellent explanation and it works so slick. Just one question. In Somewhere Over the Rainbow – Key of C, I also play an E7 …. if transposing to the Key of G, what would the E7 transpose to? How do I figure that one? Hi Waterdog, great question! For seventh chords, the idea is the same. First, it helps to look at the notes in a C major scale: C, D, E, F, G, A, B. As you can see, the “E” note is the third degree in a C major scale (an “E” note is the root note in an E7 chord). Then, list out the notes in a G major scale: G, A, B, C, D, E, F#. What is the third scale degree in a G major scale? You are correct if you said the note “B”. In this way, if you were to play “Somewhere Over the Rainbow” in the key of G, an E7 in the key of C would transpose to a B7 in the key of G.
Hi Brett, Great stuff! Thought I would mention that in Hawaiian songs there is usually a 3 note vamp at the beginning and end of songs, so you might want to explain is almost always the two 7, five 7, one, i.e. in the key of G would be A7, D7, G. It took me a long time to memorize the vamps for each key, so this would be helpful to beginners if they are already learning from you how to use the Roman numerals to transpose. Only been learning for five months and your lessons have been great. This one will help a lot later on when I try to learn some songs that need to be transposed. Again thanks a lot for the help. Glad to hear it, Richard! thank you so much!!! I am 50 years old and have finally learned this thanks to your beautiful explanation!! Hi Mary, great question. Are you talking about working out chords in sheet music where there might not be guitar chords written above the music? Like a hymnal or something? For stuff like that, you’ll have to see how the notes “stack” up with each other in the treble and bass clefs of the sheet music. In the bass clef, look at what note is the lowest in the chord. Chances are that will your root note of the chord. When I’m doing this, I like to write out the note names with a pencil above the chord in the sheet music and that way I can “see” the chord better. This requires a pretty good grasp of music theory and how to form different kinds of chords. Very very neat…thank for putting on line. Here’s my question: using the roman numbers to express the seven cords – why are some major cords, some minor cords and one diminished cord? Is this just a convention or is there some reason or logic behind the assigning of the major, minor and diminished cords? Very good question, Don. The answer to your question is a little bit elaborate as you might have anticipated, but the short answer is that, yes, there is a logic behind how chords are built from a major scale. Based on a major scale, the I, IV, and V chord will always be major; the ii, iii, and vi chord will always be minor; and the vii^o will always be diminished. This is because of how the notes of the scale “stack up” with each other on a music staff. The intervals between the notes in the chord determine the quality of the chord (major, minor, diminished, augmented). Thanks for another great tutorial – you have a very good style of explaining. I recently acquired your Ukulele Exercises book and it is without doubt the best I’ve come across (and I have picked up a few!). Please keep up the good work. Thanks, Kevin! So glad you’re enjoying the book. I appreciate it. Hi Brett. I understand how to transpose and how to figure out what chords would be in the song but in Somewhere over the Rainbow how do you know the order to put them in? I know it has to do with progression and one chord goes to another chord. Is there an easy way to figure it out? It starts out C Em F C and then goes to F C G Am how did they get the F C G Am as the next chords or how would I know what order to put them in? Hi Keith, I imagine that those chords are in that order because that is how the composer and songwriter chose to write the song. There is some theory behind what chords sound good to transition to but that is another topic. When it comes to transposing, it might be helpful to print out the chord chart for Somewhere Over the Rainbow in the key of C.
From there, go through the chord chart and for every C chord you come across, cross it out and put a G chord next to it. For every Em chord you come across, cross it out and put a Bm chord. Continue to transpose all the chords in this manner and you won’t need to worry about rearranging the order of the chords. It worked! I now have a whole songbook transposed into keys my almost alto voice sings comfortably. Thanks very much. Can you teach Bari uke, especially fingerpicking melodies? Love your voice and your teaching style. In an old song, my Mom used to sing. “Your Cheatin Heart” by Hank Williams. The Chords used are G7 C C7 F with one D7. Am I safe to assume that this is in the key of G? If I transposed this to the key of C the chords will be, C F F7 Bb and the D7 to a G7. Is this correct? I would like to change from the key of G to the key of F.
So it would be F Bb b7 E and E7? I am not sure about the E.
Am I close to getting it right? I usually don’t transpose to many songs but decided to finally try to learn too. Go easy on me. Thanks. I was wondering if you could make up a chart of using capo. I have an elderly player who can only play one chord progression and a capo may help her. I’m not sure how it works.